"In March, I noted that Microsoft was cultivating five of its businesses to be among the next to reach a $1 billion annual run rate. In addition to Windows Azure, the others on the short list included Windows Intune, Microsoft's device management/security service; Bing Maps; the StorSimple cloud-storage appliance technology; Perceptive Pixel, which makes large, multitouch displays; and Parallel Data Warehouse, Microsoft's parallel data-warehousing appliance which integrates directly with Hadoop. On April 29, Microsoftofficials told the folks at Bloomberg that Azure had crossed the $1 billion threshhold. The Softies also said Azure subscriptions have risen 48 percent in the past six months, Bloomberg reported." "The goal of Google Now, he said, "is to get you the right information, at just the right time." He noted the key features of the service, including that it provides people with their boarding passes and delivery updates as well as traffic conditions, local sports scores, and upcoming weather conditions without prompting. "Looking for the nearest pharmacy? Just ask Google for directions, and we'll deliver them instantly," Page said. "No typing needed. And you can now ask conversational questions like 'Do I need a jacket this weekend?'"" On Monday, Eucalyptus introduced a new version of its product that allows customers to test even bigger projects before they move to the Amazon service. In the future, Mr. Mickos said, the company would look to make its product compatible with Google’s service as well. “It is the most interesting strategic thing we can do,” he said. “Amazon is the standard now, Google will compete. There is an old world that won’t cross over.”"
"Any wholesale online expansion raises the specter of professors being laid off, turned into glorified teaching assistants or relegated to second-tier status, with only academic stars giving the lectures. Indeed, the faculty unions at all three California higher education systems oppose the legislation requiring credit for MOOCs for students shut out of on-campus classes. The state, they say, should restore state financing for public universities, rather than turning to unaccredited private vendors. But with so many students lacking access, others say, new alternatives are necessary." "What exactly does this mean? Well, even other very modern Web companies have far more process-laden procedures for updating the millions of code that make up their sites. Some will cleave off big chunks of code and hand them out to separate teams and then come back and try to assemble the parts into a functioning whole. Such companies as Facebook (FB) and Google also have special teams that review the lines of code written by developers. It’s these people who get to decide when a new feature is ready to make its way to their websites. Not LinkedIn. It has one, huge stash of code that everyone works on, and algorithms do the code reviewing. “Humans have largely been removed from the process,” Scott says. “Humans slow you down.”"
"The biggest problem is sorting messages quickly, which the MessageSight can do. It has the capability to process 13 million messages every second, and can route them to the proper place. Once they’re sorted and collected, they can be analyzed for patterns. If you’re seeing a certain kind of equipment failing at a regular interval, you can order more preventative maintenance or track down a faulty component. IBM has long been making the case that this kind of analysis — “analytics” is one of Big Blues favorite words these days — can lead to important insights that can help pretty much any business operate more efficiently and save costs." "However, the iOS version of Google Now is not as complete as the version on Android. For example, the iPhone and iPad Google Now version will not provide users with information about concerts or nearby events. The iOS version also cannot provide users with their boarding pass if they have an upcoming flight. Additionally, users cannot get push notifications from Google Now. Instead, users must tap on the Google app every time they want to see the latest information provided by Google Now." ""By making Parse part of Facebook Platform, we want to enable developers to rapidly build apps that span mobile platforms and devices," wrote Purdy. "Parse makes this possible by allowing developers to work with native objects that provide backend services for data storage, notifications, user management, and more. This removes the need to manage servers and a complex infrastructure, so you can simply focus on building great user experiences."" "But the technology itself? Well, if it does disappear inside normal glasses perhaps it has a chance. But once again, interrupting a conversation with someone to interrogate it? We’ll have to rethink thousands of years of human interaction, and that’s unlikely to happen any time soon. So Google Glass for me will be this era’s Segway: hyped as a game changer but ultimately used by warehouse workers and mall cops." "It’s worth noting that the initial funding for Wikidata’s development has come from Google, the Gordon and Betty Moore Foundation, and the Allen Institute for Artificial Intelligence. Ultimately, Wikidata is precisely the sort of venture that is needed to feed the nascent semantic web and AI movement. It’s far from the only venture in this space – I’d also recommend keeping a close eye on Google’s Knowledge Graph, which powers Google Now, and Wolfram|Alpha, which partly powers Siri – but all these (often intertwined) projects are essentially trying to do the same thing: to turn facts into something that machines can understand." "The technology is the product of Gild, the 18-month-old start-up company of which Mr. Bonmassar is a co-founder. His is one of a handful of young businesses aiming to automate the discovery of talented programmers — a group that is in enormous demand. These efforts fall in the category of Big Data, using computers to gather and crunch all kinds of information to perform many tasks, whether recommending books, putting targeted ads onto Web sites or predicting health care outcomes or stock prices." 1. I will never live a day of my life from now on without it (or a competitor). It's that significant. " "The security system, called AT&T Digital Life, will allow homeowners to connect appliances like light bulbs, video surveillance cameras and door locks to the Internet and control them remotely with a smartphone app. For the security aspect, the service hooks up to AT&T’s monitoring center, where employees will respond to emergencies and alert the police or the fire department. Finding new revenue streams is important for AT&T and the wireless industry in general. Most people who want a cellphone already own one, so all the phone carriers, with the exception of Verizon Wireless, are seeing a sharp slowdown in the number of subscribers added each quarter; at some point, the revenue from phone bills will stagnate." "The Facebook CEO adds another impressive few names to the roster of his D.C. political advocacy group on Friday; Microsoft founder Bill Gates, current Microsoft CEO Steve Ballmer, Intuit CEO Brad Smith and Sean Parker of Facebook and Napster fame have all joined FWD.us, Mark Zuckerberg’s pet D.C. project aimed at changing the way Washington handles issues around immigration, education and employment issues." A strong quarter for Android Handset Corp.
"Samsung has challenged Apple’s once dominant place in the world’s smartphone market by flooding it with a range of models with a variety of screen sizes and prices and updating its versions faster than Apple ever has. Samsung captured a third of the global smartphone market in the first quarter, according to data released by Strategy Analytics. Shipments of Samsung smartphones surged 56 percent to 69.4 million units in the quarter, it said. Apple iPhone shipments rose 6.6 percent to 37.4 million units." "That is a feature few rivals offer. 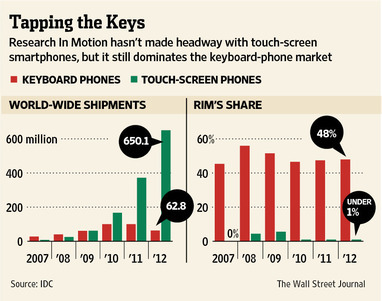 Touch-screen phones with physical keyboards, especially from the most popular brands, are rare, and they’re usually not especially successful." "In general, there is plenty that the dominant Internet providers can do to provide better deals without much effort, she says. Cable companies like Time Warner Cable and Comcast have the technical capacity to speed up service, and also plenty of room to lower prices, given the estimate from one analyst—Craig Moffet of the Wall Street firm Bernstein Research—that they typically make 97 percent profit margins on Internet services. The competition may be even hotter in the newer Google Fiber battlegrounds. After Google announced plans for Austin (see “Google Fiber Takes on Texas”), AT&T quickly announced it would match that effort with its own one-gigabit service, and Time Warner Cable sweetened its Internet plans with free Wi-Fi in public areas to existing customers." "HP is hoping the $169 price will attract buyers -- competitive 7-inch Android tablets from big-name device makers are priced higher, with Google's Nexus 7, Amazon's Kindle Fire HD and Samsung's Galaxy Tab 2 7.0 starting at $199. The low-priced Slate 7 represents a turn of events for HP, which in August 2011 said it would explore the sale or spin off of the Personal Systems Group, which deals in client devices like PCs and tablets. HP ultimately retained the PSG, but earlier considered the unit a drain because of its low margins. HP also killed off webOS smartphones and tablets in August 2011, prompting a buying frenzy in which the company sold the remaining TouchPad tablets at rock-bottom prices starting at $99." "It’s Actian’s third significant acquisition since 2011. In January it paid $162 million for Pervasive Software, a publicly held software company. Late last year it paid $37 million for Versant, beating out a bid from another company. Financial terms were not disclosed since both companies are private. But the deal marks an exit for ParAccel’s investors, including Amazon, MDV, Bay Partners, Walden International, Tao Venture Partners and Menlo Ventures, who had put in a combined $64 million since its founding in 2007. The most recent capital injection was a $20 million venture round led by Amazon that was announced a year ago." "In sum, Austin said that Microsoft Office provides the best Windows platform strategy, and that it is less disruptive to IT departments, as well as offering richer functionality to power users. On the other hand, going with Google Apps represents the best heterogeneous strategy, with more innovative products and better cloud-based infrastructure. As for Microsoft Office 365, Austin said that "it's evolutionary" and that "we're not sure Microsoft can beat Google's pace of innovation."" "Since RaptorXML can process documents in parallel, Falk sees a future use for it in the realm of Big Data. “The transaction-level data views give regulators deeper insights into the stability of banks. But switch from [profit-and-loss] statements to transaction level, and XML documents quickly balloon from megabytes to gigabytes,” he said. “Add to this the monitoring of multiple banks, and now you are very quickly in terabyte space, and the speed of validations comes into the discussion,” he continued. “Then, regulators are going to have to store the data after they validate it, and now you’re into Big Data. You might go to a Hadoop solution to store” the data and to run Map/Reduce functions against it, he said, noting that Hadoop integration with RaptorXML is something Altova is looking at." "Thus far, he has transposed the tweet that he composed for Colbert and added two more -- very much introductory affairs. He has chosen only to follow two humans: Colbert and Chelsea Clinton. Oddly, former Secretary of State Hillary Clinton isn't yet a twitterer. It can surely be only a matter of time. For his part, Colbert welcomed the new arrival with his customary generosity: "I taught @billclinton to tweet! This is almost as exciting as the time I taught Cheney "Dance Dance Revolution."" "General Electric just announced that they are pouring in $105 million in investment into Pivotal, the VMware (EMC) spinout that is focusing on the new modern era of developers and cloud. This new investment is on top of the big investment that VMware and EMC are making. This puts Pivotal in a class by itself in terms of startups in that they are “super funded”. With the GE investment this makes Pivotal an instant Startup Superpower – giving them an unfair advantage over their competitors across the board." Perhaps time to dust off the Internet 1.0 glossary and review "disintermediation"
"But Hastings also reiterates his argument that there’s room for lots of streaming video services, just like there are lots of cable channels today. Translation: Don’t worry, Jeff Bewkes: Just because we’re coming for you doesn’t mean we’ll crush you. Also, please keep selling us Time Warner’s content! Thanks!" "How much do your customers overlap? Zingale: As we both disrupt the new wave of enterprise applications, Jive has always attacked the larger companies, the ones with thousands of knowledge workers. The attraction for us is that Box has a huge reach within small companies, but also small groups within large companies like American Express or Fidelity or Procter and Gamble using Box is very interesting to us. Levie: There probably isn’t an enterprise over 1,000 employees that we talk with that isn’t either on Jive or exploring Jive, mainly because social is the type of product where you want it to go across the entire company and not just be integrated with your sales applications." "The One’s screen comes alive whenever you fire it up, thanks to a user interface with a silly name (BlinkFeed) and a wonderful new look. Instead of a bunch of icons, BlinkFeed shows a set of colorful tiles headlined with the latest feeds from your favorite Internet sources. You can set it up to show incoming Facebook or Twitter messages from friends and colleagues, as well as news headlines or sports scores. BlinkFeed constantly downloads new items, refreshing your screen whenever you touch the home button. Notice a trend here? Microsoft Corp. started it with the “live tiles” on its underrated Windows Phone software, and Facebook’s new Home app for Android also constantly pumps updates onto the user’s screen. But the iPhone’s static icons have scarcely changed since the Red Sox last won the World Series. It’s become the Toyota Camry of smartphones: well-built, reliable, and dull." "The set-top box is being developed by Amazon’s Lab126 division in Cupertino, Calif., which has toyed with building TV-connected devices for several years, the people familiar with the effort say. The project is being run by Malachy Moynihan, a former vice president of emerging video products at Cisco Systems (CSCO) who worked on the networking company’s various consumer video initiatives. Moynihan also spent nine years at Apple (AAPL) during the 1980s and 1990s. Among the other hardware engineers working at Lab126 with considerable experience making set-top boxes are Andy Goodman, formerly a top engineer at TiVo (TIVO) and Vudu (WMT), and Chris Coley, a former hardware architect at ReplayTV, one of Silicon Valley’s first DVR companies." "Given the increasing frequency of attacks, like today’s attack on the AP, or recent ones against the BBC and 60 Minutes, it seems like it would behoove the company to get something out now, even if imperfect, and iterate later. That might mean launching with an SMS only solution, but even that would be better than the current system that relies on passwords alone. One interesting wrinkle with two-step and Twitter is that many of the accounts most prone to hacking have multiple, sometimes very many, users who use a variety of applications. Which means that any solution is likely going to have to support multiple devices, and multiple apps." "Los Angeles-based film distributor Cinedigm has partnered with BitTorrent to promote Arthur Newman by releasing its first seven minutes for free. Seven minutes of a movie may not be very much—basically an extended trailer. But Cinedigm is hoping that you’ll be so enamored of Colin Firth’s bumbling eccentricities and Emily Blunt’s sullen expressions that you’ll buy a movie ticket to see the film in theaters. “It’s a promotional play on one of the biggest platforms,” Jill Calcaterra, the chief marketing officer at Cinedigm, wrote to Bloomberg Businessweek in an e-mail. “We are simply taking the way [BitTorrent] has been used in the past and turning it on its head.” In that sense, Cinedigm’s marketing move is a turning point for the industry—not unlike going into business with the guy who stole all your lunch money in middle school." "Looking to getting its product into the hands of more people, Nuance Communications announced today that its Swype virtual keyboard for Android will be available from the Google Play store starting Wednesday. The introductory price is 99 cents, and there’s also a free 30-day trial version." “The Q10 looks similar to the once-popular BlackBerry Bold, which was introduced in 2009 and was the last phone to run on the company's old operating system. It will have both a classic physical keyboard and a small touch screen and will run on RIM's new operating system, BlackBerry 10. Carriers and retailers are advertising the device at roughly $200 with a multiyear plan, putting it in line with other high-end devices on the market. "I’ve been testing the Galaxy S 4 intensively for four days and while I admire some of its features, overall, it isn’t a game-changer. It’s an evolution of the prior model and despite some improvements, it still is especially weak in the software Samsung adds to basic Android. I found Samsung’s software often gimmicky, duplicative of standard Android apps, or, in some cases, only intermittently functional. I urge readers looking for a new Android smartphone to carefully consider the more polished-looking, and quite capable, HTC One, rather than defaulting to the latest Samsung." "Timothy D. Cook, the company’s chief executive, said in a conference call with analysts that the decline in the stock price has been “very frustrating to all of us,” but that Apple remains strong. “Our teams are hard at work on some amazing new hardware, software and services that we can’t wait to introduce this fall and throughout 2014,” Mr. Cook said. Mr. Cook even dropped a hint about “exciting new product categories” that Apple could enter, suggesting the company is preparing a move into a new market." "In the end, the Galaxy S4 is a good choice for people at opposite ends of the technical spectrum: gadget hounds who love to customize at one end, and (thanks to Easy Mode) the easily overwhelmed at the other. For everyone else, the S4 may be buggy in spots and laden with not-quite-there features. But the basics are excellent; this phone is still a fast, bright, handsome pocket rocket. It easily earns its place as a successor to the Galaxy S3 and a rival to the iPhone. Next time, it may be Apple’s turn to try harder." "Researchers from the Masdar Institute of Technology and the Qatar Computer Research Institute plan to launch Verily, a platform that aims to verify social media information, in a beta version this summer. Verily aims to enlist people in collecting and analyzing evidence to confirm or debunk reports. As an incentive, it will award reputation points—or dings—to its contributors. Verily will join services like Storyful that use various manual and technical means to fact-check viral information, and apps such as Swift River that, among other things, let people set up filters on social media to provide more weight to trusted users in the torrent of posts following major events." "It’s my personal concern that the exodus of great individual analysts from the great analyst firms is symbolic of a slow death of the romance and intrigue of the industry analyst industry as we once knew it. The tech analyst industry grew up on great personalites and thought leaders who thrived on innovation and the exciting changes technology was bringing to the world. Today, the succession of turgid reports, many of which read like they are written by automated robo-analyst applications with the words Big Data, Cloud, Analytics, Mobility and Transformation being spewed out at periodic moments, is killing research as we know it." "Small businesses are losing more than US$24 billion in productivity each year when nontechnical employees, referred to as involuntary IT managers (IITMs), are tasked with managing their companies’ IT solutions. This loss is a direct result of IITMs taking time away from primary business activities, according to an AMI-Partners small-business study commissioned by Microsoft Corp."
"But both Hatch and Sitaram agree that contributing to open source is one of the best ways to land a job in software. “It makes it easier to hire technical talent,” Hatch says. “You can see how someone’s evolved — or not evolved — as a developer. We’re extremely wary of hiring people who haven’t contributed to open source.”"
"When Ted Sarandos, the chief content officer for Netflix, told GQ in an interview published three months ago that “the goal is to become HBO faster than HBO can become us,” maybe he was on to something. The company’s stock soared on Monday, passing $200 a share in after-hours trading for the first time since 2011, after it reported robust first-quarter earnings and hailed the success of its first original series, “House of Cards.” By one measure Netflix now has more subscribers than HBO in the United States." "Much of the investor nervousness is rooted in how Wall Street is treating and valuing the Cupertino, Calif., company as a traditional hardware maker. One camp of analysts and some investors said there is strong evidence that Apple should be viewed in a different light: as a software-hardware hybrid. The distinction matters. If it continues to be seen as a hardware business, Apple's streak—driven by products like the iPhone and iPad—could run out quickly as smartphones and tablets get commoditized and consumer tastes change. It is a lesson learned by companies like BlackBerry-maker Research In Motion Ltd., whose tech hardware was quickly eclipsed by products from Apple itself." "Your apartment is an electronic orchestra and you are the conductor. With simple flicks of the wrist and spoken instructions, you can control temperature, humidity, ambient music and lighting. You are able to skim through the day's news on translucent screens while a freshly cleaned suit is retrieved from your automated closet. You head to the kitchen for breakfast and the translucent news display follows, as a projected hologram hovering just in front of you. You grab a mug of coffee and a fresh pastry, cooked to perfection in your humidity-controlled oven, and skim new emails on a holographic tablet projected in front of you. Your central computer system suggests a list of chores your housekeeping robots should tackle today, all of which you approve." I do love Google Reader. All I can tell you is that there are very good choices on alternative readers and we needed those people to work on other, much more integrated products. It's always about priorities. The thinking that Larry [Page], Sergey [Brin] and I had was that it was time to stop throwing things over the fence and seeing what happened, but have a much more sophisticated understanding of the global impact of our problems and products. The term that we use internally is spring cleaning and Google Reader is an example of spring cleaning." "Everyone wants to know what Google Glass is good for. I’ve figured it out: It’s the killer app for your car. I spent several minutes playing with a prototype pair of Google Glass, and while the phone and messaging notifications are cool and the interface is surprisingly slick, it’s the navigation and GPS functionality that has me champing at the bit." "Google's Eric Schmidt and Jared Cohen, fresh from a visit to North Korea in January, on why the Internet is far from an unalloyed good to the citizens of dictatorships around the world." And it’s going to let you boot to the desktop, bypassing the loathed new Start screen, too. I’ve confirmed these rumors with my own sources, as has my Windows Weekly co-host Mary Jo Foley, so I think we can move this one into the “fact” category, though of course details about how these changes will be implemented remain foggy." See the full article for an interview with DPLA executive director Dan Cohen; unclear why it's "Digital Public Library of America" instead of "Digital Public Library of Earth," since it includes "archival content from all over the world"
"What is the Digital Public Library of America? What do you hope it will become? The idea behind the Digital Public Library of America is fairly simple actually -- it is the attempt, really a large-scale attempt, to knit together America's archives, libraries, and museums, which have a tremendous amount of content -- all forms of human expression, from images and photographs, to artwork, to published material and unpublished material, like archival and special collections. We want to bring that all together in one place." "IBM has a history of aggressively shifting its business mix to areas with better growth and higher profit margins. The company shocked the technology industry when it agreed to sell off its PC business to Lenovo before personal computers had been largely commoditized. IBM then beefed up its operations in higher margin software and consulting businesses. A sale of the low-end part of the server business would fit this pattern, as new Chief Executive Virginia "Ginni" Rometty looks for ways to expand the company's revenue and earnings. A divestiture of the x86 business would mark Ms. Rometty's first major asset sale since taking over the top job a year ago." "Trying to become yet another social network that demands people’s time and attention may seem like an uphill journey. Just ask the team over at Google Plus. But LinkedIn, which declined to comment on the Pulse purchase, is pushing ahead to try to build a group of users interested in both finding the right job and performing well in their current positions. That may distinguish the company from Facebook (FB) and Twitter enough for it to stand on its own. “Social is splintering into more narrow-based services,” says Michael Wolf, the founder of technology and strategy consulting firm Activate. “Facebook may not necessarily be the place where you want both your personal and professional friends.” For LinkedIn, content is king, but so is context." “Computing pioneer International Business Machines Corp. on Thursday reported its revenue dropped 5% after failing to close big software and hardware deals. Software giant Microsoft Corp., once known for rapid sales of PC software, reported that the business that includes its Windows operating system turned in essentially zero growth after one-time effects of software revenue deferrals. "One issue is that Apple is a favorite stock among individual investors. The investment firm SigFig estimated last fall that 17 percent of all retail investors owned Apple stock, four times the number that owns the average stock in the Dow Jones industrial average. Trading by retail investors can be amplified by hedge funds, who see everyday investors piling in and push in the opposite direction by shorting the stock, betting it will decline. The so-called short interest in Apple reached a peak last November, but hasn’t gone down much since then, according to data from Nasdaq." "The private equity giant, along with a separate bidder, the activist investor Carl C. Icahn, had been inspecting the books of the personal computer maker before deciding whether to make a rival bid to the $13.65-a-share offer to take the company private from the company’s founder, Michael S. Dell, and Silver Lake Partners, a technology-focused private equity firm. Blackstone decided to withdraw after discovering that Dell’s business was deteriorating faster than it previously understood, the people involved in the negotiations said." "Millions of digitized books, pictures, and manuscripts from the nation’s top public and academic libraries are now available in one spot. It isn’t Amazon or Google, and it’s free. The privately funded Digital Public Library of America was launched Thursday and provides users with access to the digital archives of institutions ranging from national the Library of Congress and the Smithsonian Institution to local historical societies." "Reading and responding to comments can be one of the most rewarding aspects of blogging. Not only do they help you connect with your readers, they can also inspire later blog entries. The challenge, oftentimes, is following all the conversations around your content—on Google+, for instance, as well as on your website. So we're making things a lot simpler. Starting today, you can bring Google+ Comments to your Blogger blog." "So far, the promotional videos for Google Glass have given us an idea of what it would be like to shoot videos through a wearable computer, so long as your life is incredibly cool otherwise. We’ve seen skydiving, ice sculpture carving, canoeing down an exotic river in Southeast Asia, and other amazing things you or I will likely not be posting on Facebook . Now that the first test units of Google Glass have gone out, however, we’re getting a look at something closer to what real humans might do with it." There are lots more features, and lots more to come." "Interestingly, Google isn’t laying its own fiber this time, but rather purchasing an existing network. “In order to bring Fiber to Provo, we’ve signed an agreement to purchase iProvo, an existing fiber-optic network owned by the city,” the company wrote in a blog post. “As a part of the acquisition, we would commit to upgrade the network to gigabit technology and finish network construction so that every home along the existing iProvo network would have the opportunity to connect to Google Fiber. UPDATE 9:00pm CT: According to the Salt Lake Tribune, Google is only paying $1 for the entire network, in exchange for upgrading it and incorporating the remaining two-thirds of city residents that are not connected to it." "Word on the street is that neither Windows 8 nor Microsoft’s Surface tablets are selling very well. It’s a safe bet that the Samsung ATIV Smart PC Pro 700T won’t turn that trend around. That goes triple for its lower-powered, less expensive sibling, the 500T. In other words, it may be that computer shoppers aren’t especially interested in paying a steep price — in dollars, features and looks — for the ability to turn their laptops into tablets or vice versa. It wouldn’t be the first time that manufacturers were more excited about a category than their customers turned out to be." "Apple doesn't even make the list of top five sellers of PCs in the world (though it is No. 3 in the United States), but some number crunching by Asymco's Horace Dediu shows a surprising fact: Apple earns 45 percent of the operating profits in the PC industry. 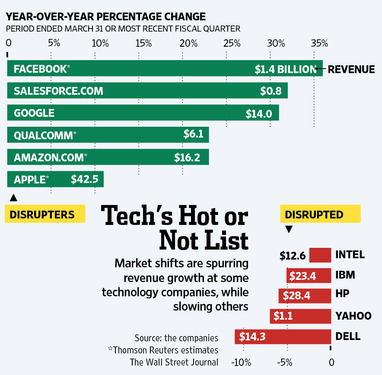 The top five sellers -- Hewlett-Packard, Dell, Lenovo, Asus, and Acer -- together make only 33 percent of operating profit." "Moreover, that Win8 test machine has been a long experiment in frustration. Microsoft's design decisions, both at the UI level and below, serve to continually get in our way. Here and there, a helpful feature provides some welcome aid, but its benefit is invariably swamped by the difficulty of the features that surround it. There is no happy momentary lift, but rather relief at a moment's respite from the cumbersomeness of the UI. We shall shortly strip off Win8 and replace it Windows 7. Reader interest in Windows 8 apps is just as muted. Articles on Microsoft's latest technology such as ASP.NET 4.5, Visual Studio 2012, and TypeScript fare well, but Win8-specific apps have been a non-starter." Later in the article: "Otellini also said he expects more standard ultrabook designs based on the upcoming Haswell chip to come in as low as $499." ""If you look at touch-enabled Intel-based notebooks that are ultrathin using [Bay Trail] processors. Those prices are going to be down to as low as $200," said Intel CEO Paul Otellini. The Bay Trail chip is a complete redesign of the Atom micro architecture and is expected to get Atom chips closer to mainstream Intel chips in performance." "If a monopolist did what the wireless carriers did as a group, neither the public nor government would stand for it. For our scrutiny and regulation of monopolists is well established—just ask Microsoft or the old AT&T. But when three or four firms pursue identical practices, we say that the market is “competitive” and everything is fine. To state the obvious, when companies act in parallel, the consumer is in the same position as if he were dealing with just one big firm. There is, in short, a major blind spot in our nation’s oversight of private power, one that affects both consumers and competition." "But outspoken Google chairman Eric Schmidt said today at the Dive into Mobile conference that he doesn’t view Android iterations like Facebook Home or Amazon’s KindleOS negatively. “I think it’s fantastic — I love it,” Schmidt said. “This is what open source is about. Open source is open source. It’s experimentation, it’s creativity. … I think it’s one of the main reasons that Android is doing so well right now. And it took some guts to do it.”"
"Other developers said it made sense for Google to be more cautious than it was with mobile phones because Glass was always in a user’s field of vision. “You don’t carry your laptop in the bathroom, but with Glass, you’re wearing it,” said Chad Sahlhoff, a freelance software developer in San Francisco. “That’s a funny issue we haven’t dealt with as software developers.”"
"So my question from a few weeks ago remains: Does anyone actually want a Facebook phone? Facebook Home is a play for the international market, the developing nations where traditional computer access is spotty, where mobile phones are fast becoming the medium of choice to access the Web, and where carriers are perfectly content charging sky-high data and SMS fees to their customers." "The deal will relieve Google of about 7,000 employees who will transfer to Arris employment, as well as a series of patent infringement lawsuits with TiVo related to digital video recorders that Arris CEO Bob Stanzione expected to result in a damages claim of "billions of dollars." During negotiations, Google apparently sweetened the sale by promising to cap any liability Arris might face in the event Motorola Home is found to have violated patents owned by DVR maker TiVo. Under the terms of the deal, Google will receive $2.05 billion in cash and $300 million in newly issued stock, giving it a 15.7 percent ownership stake in Arris upon the deal's closure. Arris will also gain access to a collection of Motorola Mobility patents." "Research firm Gartner expects the market for wearable smart electronics to be a $10 billion industry by 2016. This isn't the first time that Microsoft has shown an interest in wearable gadgets. Microsoft a decade ago unveiled a "Smart Watch" powered by the company's software. For a subscription fee, Smart Watch wearers could have news headlines, sports scores and instant messages beamed over FM radio to their wrists. But sales stopped in 2008. For its potential new watch prototype, Microsoft has requested 1.5-inch displays from component makers, said an executive at a component supplier." "If it abides by the agreement, though, Google will avoid fines and a formal finding of wrongdoing. Google will also escape the lengthy and expensive antitrust battles that Microsoft faced in Europe over its media player and server software. Herbert Hovenkamp, a professor of antitrust law at the University of Iowa, said the penalty faced by Google was light. “The ‘no fine’ conclusion is a pretty important one,” said Mr. Hovenkamp, who has in the past been a paid adviser to Google. “The question you have to ask is: Is labeling going to change any consumer behavior? And if the answer is no, then it’s not going to do any good for Microsoft Bing or for any rival search engines.”"
“Another, more ironic reason, for the decline in PC sales is the high quality of today’s computers. Most machines made in the past few years can easily perform popular computing tasks, so there’s little reason to upgrade. "The philosophical misconception, however, seems to me to be even bigger. Goldbugs and bitbugs alike seem to long for a pristine monetary standard, untouched by human frailty. But that’s an impossible dream. Money is, as Paul Samuelson once declared, a “social contrivance,” not something that stands outside society. Even when people relied on gold and silver coins, what made those coins useful wasn’t the precious metals they contained, it was the expectation that other people would accept them as payment. Actually, you’d expect the Winklevosses, of all people, to get this, because in a way money is like a social network, which is useful only to the extent that other people use it. But I guess some people are just bothered by the notion that money is a human thing, and want the benefits of the monetary network without the social part. Sorry, it can’t be done." "At the same time, the Google search team is very confident that it can realize its Star Trek dreams. “You already see hints of the Star Trek computer in your phone,” Singhal said. “Now we’re trying to get it to a point where it passes the ‘toothbrush test’ of you using it twice a day.” Singhal predicted that will happen in three years’ time—by then, he says, Google’s Star Trek machine will be so good that you’ll ask it a question and expect a correct answer at least twice a day. “And in five years you won’t believe you ever lived without it. You’ll look back at today’s search engine and you’ll say, ‘Is that really how we searched?’” Singhal says. He adds: “These are the best times we’ve ever had in search. I have done this for 22 years, and I've been at Google for 12 years, so I should know. This is the most exciting time—every morning I come into work more excited than ever. Strap in. It's all happening in our lifetimes.”"
“Trading tulips in real time,” is how longtime UBS stockbroker Art Cashin described Bitcoin’s vertiginous rise, comparing it to the now-unfathomable craze that saw 17th-century Dutch speculators trade spectacular sums of money for a single flower bulb. “It is rare that we get to see a bubblelike phenomenon trade tick for tick in real time,” he said in a recent note to clients." blog.vrypan.net | You know, Google, the web already had this feature. "My personal stream was my RSS feed, you want me to replace it with a Google+ profile. My news aggregator was the RSS aggregator of my choice, you want me to use a semi-read-only version called Google+. My browser would auto-discover the stream related to any page I visited and would allow me to subscribe to it, now you want me to use a Google+ chrome plugin which in addition kills my privacy. Oh, right, I forgot: You killed RSS auto-discovery in chrome, Google reader is dead, and Feedburner is a living dead. I get it." And Evernote is working on Evernote Century, which would guarantee that information stored on Evernote is accessible for 100 years and let people designate who can have access to it, even if Evernote goes out of business. Of course, if we reach the Singularity, as many in the tech world believe we will, we will not need these tools because we will all live forever." "But distributing a desktop browser is hard and expensive (especially if you don’t have an operating system or the world’s most trafficked website to promote it). We knew that when we started. What we didn’t know was how much time we’d spend keeping up with Chromium (the open source foundation of Chrome, upon which Rockmelt is based). What started out as 10% of our time soon became 50%–taking away cycles we needed to spend doing the innovative stuff that made us different. On the positive side, when we dug into what people loved about Rockmelt, we saw an opportunity to deliver the content from people’s favorite sites and friends in a much more compelling, streamlined way." "This week I’ve been testing the HP Pocket Playlist ($130), a portable storage drive with built-in Wi-Fi that can stream DRM-free (non-copyright-protected) video, music and photos to up to five devices via an accompanying app. Designed for those with large media libraries and for families who want to share content, this smartphone-size accessory has 32 gigabytes of total storage, so it can hold roughly 16 full-length movies, 7,600 songs or 10,000 photos. You can even use a service called PlayLater to record streamed content from services like Hulu and Netflix, then store it on your Pocket Playlist to watch later without an Internet connection." "Perhaps worse, according to a report from Detwiler Fenton, customer returns of the Z10 are actually outnumbering sales. “We believe key retail partners have seen a significant increase in Z10 returns to the point where, in several cases, returns are now exceeding sales, a phenomenon we have never seen before,” Detwiler analyst Jeff Johnston writes in the report." "The Winklevii, as they are known, have amassed since last summer what appears to be one of the single largest portfolios of the digital money, whose wild gyrations have Silicon Valley and Wall Street talking. The twins, the first prominent figures in the largely anonymous bitcoin world to publicly disclose a big stake, say they own nearly $11 million worth. Or at least $11 million as of Thursday morning — when trading was temporarily suspended after the latest and largest flash crash left a single bitcoin worth about $120 and the whole market worth $1.3 billion. At one point, the price had plummeted 60 percent." "This social reading start-up is working on their own replacement to Google Reader, and one step Digg made in that direction was to ask current Google Reader users what we liked. Over 17 thousand users have already filled out the survey, and Digg has noticed that the average Google Reader user spends a lot of time in the service. For example, over 60% of users report that they subscribe to 50 or more RSS feeds in Google Reader, with nearly 20% subscribing to more than 250 RSS feeds. The survey has also shown that 80% of users check Google Reader many times a day, and that we are using it both for work and for personal reading." “How long before the company gets bored with Keep and does the same? I am not quite ready to stop using other favorite Google services, but I do not feel like signing up for a new one that may disappear in a few years. Facebook emoji: Status-update emoticons are bad for privacy, good for advertisers. "Coupled with this TV functionality, Microsoft's next-generation Kinect sensor will also play a role in the company's TV focus. The Verge has learned that the next Kinect will detect multiple people simultaneously, including the ability to detect eye movement to pause content when a viewer turns their head away from a TV. Microsoft is said to be using these capabilities as part of its UI and features for its TV plans." "But the implications are far more serious for Windows. Imagine what would have happened if Office for iPad had shipped alongside Office 2013 for Windows 8/RT (remembering that these products were originally scheduled for a concurrent release). It’s even worse when you look back and realize how awful the first-gen Windows 8/RT devices were, with PC makers not shipping adequate volume or diversity of tablets and other non-traditional PC devices. Office for iPad, launched at the same time as Windows 8/RT, would most likely have killed the market for Windows 8 and RT devices." "Facebook on Wednesday rolled out a long-anticipated and potentially lucrative way to show highly targeted advertisements to its users. What consumers have bought in the past, online and offline, is the best predictor of what they are likely to buy again, marketers say. Facebook has partnered with four data companies that track, to varying degrees, online and offline purchase behavior: Acxiom, Blue Kai, Epsilon, and Datalogix." The alliance announced on Tuesday means the three anti-trafficking networks, which operate emergency hotlines in North America, Europe, and Southeast Asia, will share data on where the emergency phone calls are originating, the ages of the victims, their home countries, and the types of criminal activities they have been forced into. With the help of Salesforce.com, Palantir, and Google, the agencies will be able to crunch data like this in real time to detect crime trends that they can then share with police and policymakers to help protect victims." "So what applications are the Glass Collective VCs excited to invest in? Andreessen said he’d like to see apps for paramedics, and a live zombie game. Google co-founder Sergey Brin said he’d like to use Glass as a viewfinder for his fancy SLR camera, and to stream GoPro action-sports cameras. Maris said he’d like scientists in wet labs to be able to conduct hands-free experiments with Glass, and for paralyzed people to be able to more easily text. He also said he enjoyed an early timelapse app that people at Google built. Doerr said developers should read David Gelernter’s “Mirror Worlds” to find inspiration, and that he wanted to see Glass used in healthcare and education. Asked whether the Glass Collective would be willing to invest in facial recognition applications for Glass, given the privacy issues, Maris didn’t say no." "What is the Office Web Viewer? It's a service that creates Office Web Viewer links. Office Web Viewer links open Word, PowerPoint or Excel files in the browser that would otherwise be downloaded. You can easily turn a download link into an Office Web Viewer link to use in your website or blog (e.g., recipes, photo slide show, a menu, or a budget template). You don't need to convert Office files for the web (e.g., PDF, HTML). Anyone can view Office files from your website or blog, even if they don't have Office. It keeps eyes on your website or blog, because readers don't need to download the file and they stay in the browser. One link will work for computers, tablets, and mobile phones." Despite some mild improvement in the economic environment and some new PC models offering Windows 8, PC shipments were down significantly across all regions compared to a year ago. 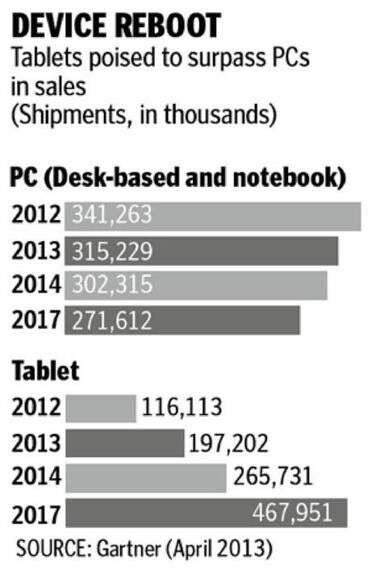 Fading Mini Notebook shipments have taken a big chunk out of the low-end market while tablets and smartphones continue to divert consumer spending. PC industry efforts to offer touch capabilities and ultraslim systems have been hampered by traditional barriers of price and component supply, as well as a weak reception for Windows 8. The PC industry is struggling to identify innovations that differentiate PCs from other products and inspire consumers to buy, and instead is meeting significant resistance to changes perceived as cumbersome or costly." An Internet identity duopoly ahead? "Although the attack ads are something new for Microsoft, denigrating the competition isn't. Most notably, Microsoft tried to undermine Web browser pioneer Netscape Communications beginning in the mid-1990s. Most of that sniping remained behind the scenes until a U.S. Department of Justice investigation into Microsoft's business practices exposed the cut-throat tactics deployed to overcome Netscape's early lead in the Web browser market. "Nothing is below Microsoft," Cusumano said. "They have been playing dirty for a long time. In this instance, they probably sincerely believe this can give them a little marketing edge and help them capitalize on the growing discomfort with the size and influence of Google."" "I don't know if Facebook will reach its target audience with Facebook Home. Although Chat Heads are great, the Home experience itself simplifies app management to a fault. I fully recognize that most people don't give their homescreens much thought and don't invest much time in customization, so it's entirely possible that I'm off the mark and there's enough functionality here for casual smartphone users — but I don't think I am. That said, I find it very telling that even this infrequent Facebook user found himself interacting with status updates instead of doing other stuff on my phone — Home radically increased my Facebook usage. If Facebook makes good on its promise to release monthly updates and these updates can significantly increase the basic utility of the homescreen, I wouldn't be surprised at all to see a lot of people start using it." "Acquiring Summly seems to have been an almost incidental side effect of a deal Yahoo made with SRI for a piece of "summarization technology." A source tells us that Yahoo has "agreements in place" with SRI for "knowledge transfer," and the acquisition of IP, code, and technology. Until Yahoo bought it, SRI International held equity in Summly. SRI once held equity in another startup that was acquired by a big Silicon Valley company. That was Siri, which was funded by SRI International's venture arm, and was later acquired by Apple. And indeed, inside Yahoo, Summly is called "Yahoo's Siri."" "I found Facebook Home to be easy to use, elegantly designed and addictive. Although I’m a regular Facebook user, I found that, with Home, I paid more attention than ever to my news feed, Liked items more often and used Facebook’s Messenger service more often. So, if you are a big Facebook fan, Facebook Home can be a big win. But I found some downsides. Facebook Home blocks the one-step camera icon some Android phone makers place on their lock screen to allow you to take pictures without first unlocking the phone. It also overlays other lock-screen features some Android phone makers include, such as weather information or favorite app icons. And if you do go to the icon-filled home screen, you’ll find that Facebook Home has taken that over as well, topping the screen with a bar that makes posting to Facebook easier and eliminating the bottom bar of heavily used apps." "Apple, meanwhile, has been looking to partner with companies to help reduce its reliance on Google's mobile services. Apple's desire to extract itself from Google runs deep. Apple, which last year ended partnerships with Google over maps and video, has explored breaking up on search for many years and its representatives recently met with companies that have search expertise, people familiar with the matter said. But Apple executives including Eddy Cue, a senior vice president in charge of Internet software and services, have said the company isn't willing to sacrifice the quality of search results and that Google's remain the best, these people said." "If it sounds confusing, that’s because it is. In removing the app-launching function from the Home screen, Facebook has wound up having to reinvent the way you open programs on your phone, and the result feels like a hack. The black-background screen to the left lists all of your apps, and scrolls vertically; the nearly identical gray-background screen lists only your favorites, and scrolls horizontally. Got it?" "Point #1: it’s about the model. Point #2: the model is contingent on exploration of the data and bringing in information from external sources. Which begs the question, if you’re not doing this, are you doing “data science”? I happen to think the answer is “no”. Meaning, if you hire a bunch of consultants to come in and “work their magic” on your data set, that is a non-starter if you accept the original premise by which the term (and some might argue, the discipline) came about. Namely, because you’re ignoring the “complex” part — the “salient part of the analysis”. Can you do that? Sure. Is it a good idea? I don’t think it is." "Ron Johnson is out as CEO of J.C. Penney. After less than two years on the job, it’s not quite clear what the next step would be for him. Luckily for him, it just so happens that Johnson’s former employer, Apple, has an opening for someone with his qualifications: SVP of Retail. Yes, that’s Johnson’s old job, the one that he held for more than 10 years. And he was really, really good at it. The establishment of Apple Stores in 2001, which he helped implement, ushered in Apple’s greatest era of prosperity. With the physical stores’ minimalist design that perfectly reflected Apple’s ethos and aesthetic appeal, and a tightly curated range of products for sale, Johnson’s Apple Store concept has attracted millions of visitors each year and inspired many imitators, even among the company’s most direct competitors." "Q. Physical books were convenient, cheap, easy to use, attractive, practically indestructible. What will the great advantages of e-books be? A. In 20 years, the space of one generation, print books will be as rare as vinyl LPs. You’ll still be able to find them in artsy hipster stores, but that’s about it. So the great advantage of e-books is also their curse; e-books will be the only game in town if you want to read a book. It’s sobering, and a bit sad. That said, e-books can do what print books can’t. They’ll allow you to fit an entire library into the space of one book. They’ll allow you to search for anything in an instant, save your thoughts forever, share them with the world, and connect with other readers right there, inside the book. The book of the future will live and breathe." "One of the first hashtags to spring up on Twitter on Monday was #nowthatchersdead, created by a website critical of Thatcher. This spurred confusion among Cher fans, mostly Americans, who read it as “Now that Cher’s dead.” Soon other Twitter users, including comedian Ricky Gervais, started mocking these panicked fans." "Major publishers in higher education have already been collecting data from millions of students who use their digital materials. But CourseSmart goes further by individually packaging for each professor information on all the students in a class — a bold effort that is already beginning to affect how teachers present material and how students respond to it, even as critics question how well it measures learning. The plan is to introduce the program broadly this fall." "The results from a first installment for 2013 report are shocking. For the first time tablets have become consumers’ preferred e-reading devices, overtaking dedicated e-readers. Now, 44% of e-book readers prefer a tablet. It’s 7% up, from 37% last August. At the same time, e-readers are a preferred device for 42% of respondents. In August 2012 it was as much as 49%. "